Community gardens at Harmar, Wiggins, and across the neighborhood are springing to life! 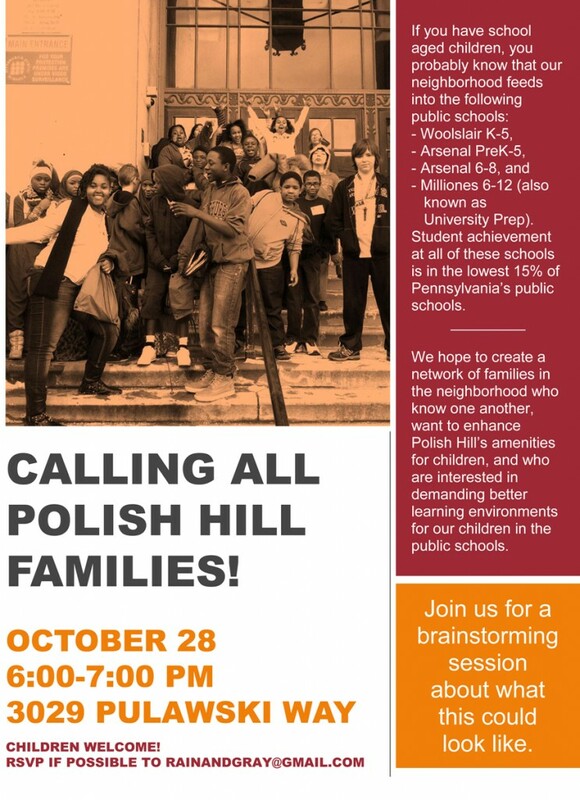 Calling all Polish Hill parents! Student achievement at all of these schools is in the lowest 15% of Pennsylvania’s public schools. A group of Polish Hill parents hope to create a network of families in the neighborhood who know one another, want to enhance Polish Hill’s amenities for children, and who are interested in demanding better learning environments for our children in the public schools. Join them for a brainstorming session about what this could look like on Tuesday, October 28 from 6:00 – 7:00 p.m. at 3029 Pulawski Way. Children are welcome. RSVP if possible to rainandgran@gmail.com. The PHCA has created a new committee – the Diversity and Inclusion Committee, with a kick-off meeting on Tuesday September 23 from 6:30 – 8:30 p.m. at the PHCA office at 3060 Brereton Street. The goal of the committee is to encourage our increasingly diverse neighborhood to work well together — respecting, appreciating and valuing our differences in background, ethnicity, lifestyle and culture. The need for this became clear after some unfortunate harassment incidents that seemed to be fueled by intolerance for cultural and lifestyle differences. between residents. The committee is being established to not only raise awareness about the benefits of inclusion and diversity and remind folks to get along, but also to put our stake in the sand as to what kind of neighborhood that we all want Polish Hill to be! At this kick-off meeting, we’ll discuss this topic and start brainstorming what we want to do. Possible projects could include an event, an art project, or a marketing campaign. 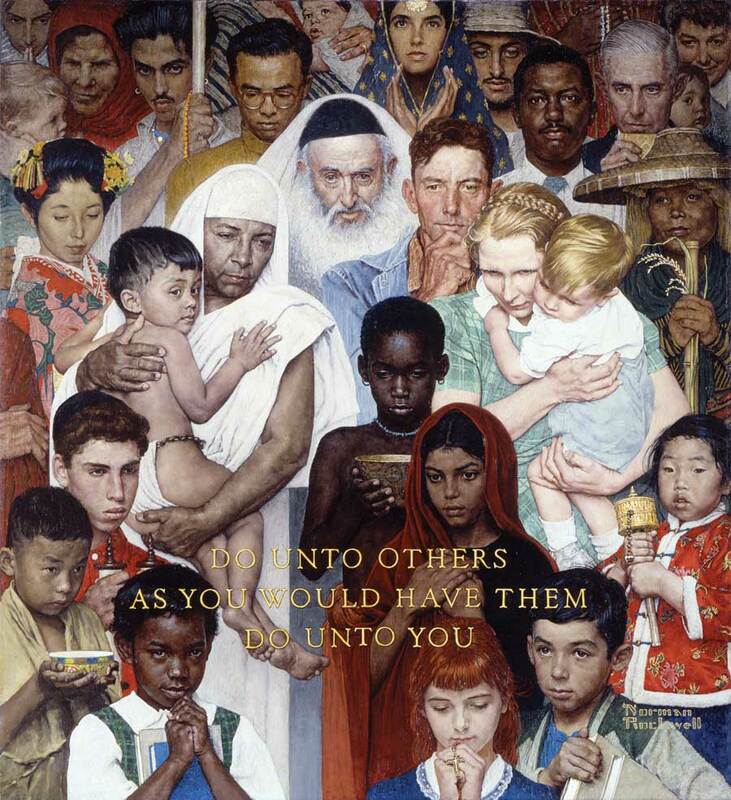 If these issues are of particular interest, if you believe civility and respect to the others who live around you is essential, your participation is welcome. Come help us to explore the possibilities of how to make Polish Hill a more accepting, respectful neighborhood. If you have any questions, or if you are not able to attend but wish to be involved with these issues, please get in touch. Email phca@phcapgh.org, or call us at 412.681.1950. The Polish Hill Pivotal Streets Façade Renovation Grant Program debuted in 2013, and the response was overwhelming. 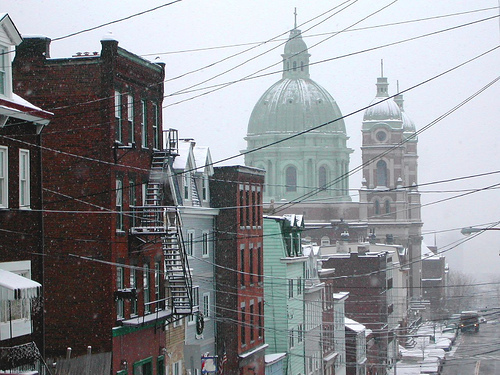 Seven projects were awarded funding (we reported about those projects in the Fall-Winter 2013 Polish Hill Voice). Stuck on what to do? Select renovation ideas from the Pivotal Streets Design Guide. Or, sign up to meet with an architect on Feb. 12 for a free 15-minute consultation about your project. Call 412.681.1950 by Feb. 5 to secure a spot. Applications are due by March 14, 2014. An independent committee will review applications and award funds. Grants are competitive and funds are limited. Awards will be announced on April 5, 2014. Reimbursement checks are issued when work is completed. The program application, guidelines, and design guide are available on our website or at the PHCA office. For more information, call 412.681.1950 or email us. John Paul Plaza residents are having their fundraising flea market and bake sale on Saturday, August 17 from 11:00 a.m. to 3:00 p.m. Proceeds from the sale will go to their entertainment and activities fund. The sale will be at John Paul Plaza, 1005 Herron Avenue, and will take place rain or shine. Residents on Melwood Street in Polish Hill will have no water from 6 p.m. to midnight Wednesday. The Pittsburgh Water and Sewer Authority will replace two water valves on Melwood during that time. Most other residents in Polish Hill will experience low water pressure and possible interruption of service. In the event of a water or sewer emergency, residents should call PWSA at 412-255-2429 or 412-255-2409. There was a nice short article in the Tribune-Review. Titled “Pittsburgh’s Polish Hill is a Neighborhood in Transition”, the piece offers a quick snapshot of the history of the neighborhood and the mix of people who now call it home. Above: at Lili Cafe. Photo by Jasmine Goldband for the Tribune-Review. TALKPGH is part of ARTPGH and DESIGNPGH, the public art and urban design components of the City’s first Comprehensive Plan called PLANPGH collectively. PLANPGH is an inclusive public initiative to create a comprehensive plan for the city’s growth over the next 25 years. TALKPGH is Pittsburgh’s first mobile talk show; it will be filmed in a transparent truck that will travel to each of the city’s 90 neighborhoods. The purpose of the show is to collect opinions and stories from Pittsburgh residents about the neighborhoods they live in. The footage will be aired as a web TV show, and the contribution of residents will be honored during a series of public screenings. TALKPGH has contacted the PHCA to help find three people from Polish Hill to be interviewed on Friday, April 19 from 4-5 p.m. Their goal is to find three interviewees who are as different from each other as possible (in age, gender, race, profession, personality, how long they’ve lived in the neighborhood, etc). 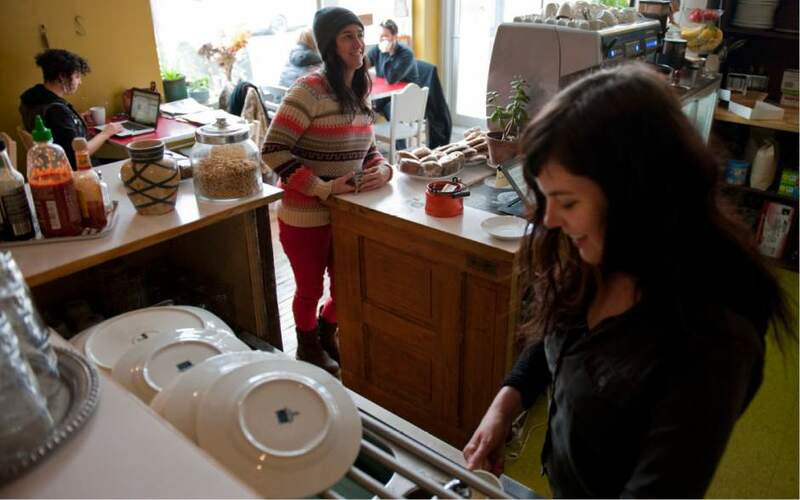 It often seems as if the same few people step forward to speak for the neighborhood. Polish Hill has such a wonderfully varied population; it would be great if some new faces volunteered to share their stories. If you’re interested, or know someone who might be, please call us at 412.681.1950 or email. 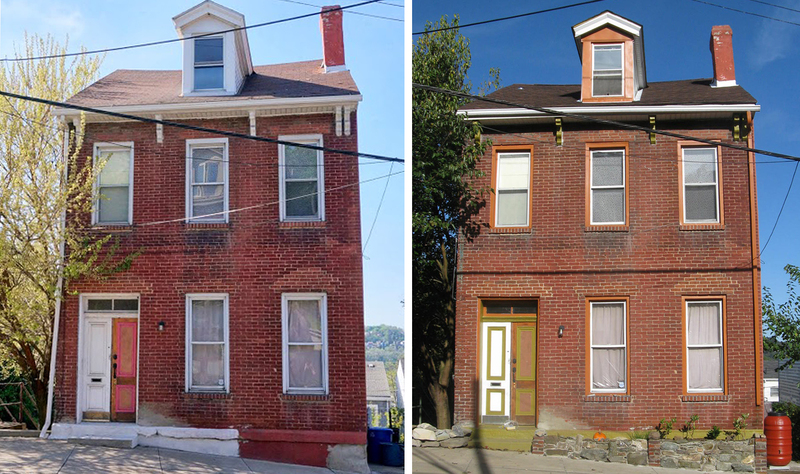 The PHCA is delighted to announce the Polish Hill Pivotal Streets Façade Renovation Grant Program. 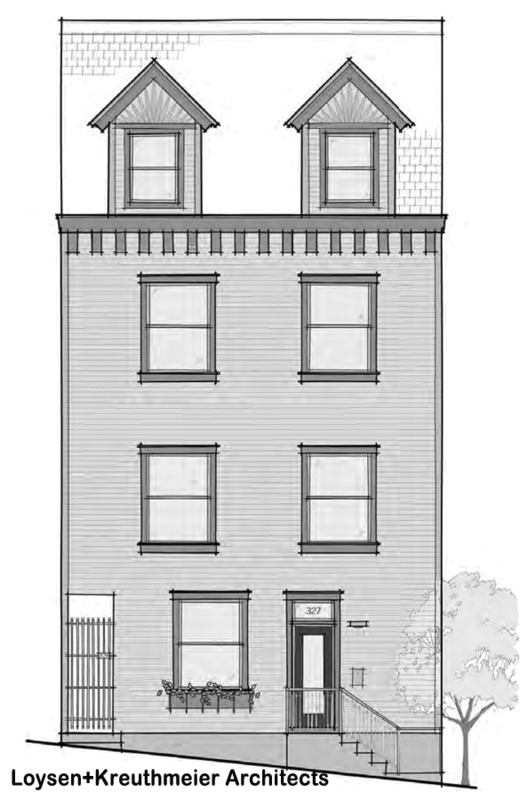 Each residential property owner in Polish Hill is eligible to apply for a 1-to-1 matching grant of up to $5,000 to renovate the façade (street-facing side) of their property. Awardees must contribute the project match amount and all amounts over the maximum $5,000 match. Grant amounts less than $250 will not be considered, meaning the façade renovation project must cost at least $500. Grant funds are reimbursed after the work is completed — in other words, the awardee must pay for the renovations upfront before receiving the grant money. Stuck on what to do? Select renovation ideas from the Pivotal Streets Design Guide. Eligibility: Polish Hill residential property owners — owner-occupied and rental — who are ready to begin their projects! Applications are due by March 30, 2013, awards will be announced by April 30, 2013 Reimbursement checks are issued when work is completed. An independent committee of volunteer professionals will review applications and award funds. Grants are competitive and funds are limited. Program funded by the PNC Foundation and Pittsburgh Partnership for Neighborhood Development. Here are the program guidelines, and here is the application. Questions? Contact us at 412.681.1950 or email us. Allegheny County Emergency Services, Human Services and Health Department have put out some information about dealing with the extreme cold. One item particularly seems relevant to Polish Hill — the County encourages residents to look out for our elderly neighbors. · Make sure seniors have a list of emergency telephone numbers that includes neighbors and family members who can help, if needed. · Check to see the furnace is working if the house feels cold. Become alert to dangerous methods of heating a room, such as open flames or ovens. · Ensure that walkways and steps leading to their homes are cleared and that there is food and water in the house. · Go back later or the next day, if at all possible, to make sure everything is still alright. Remove your coat and stay at least 15 minutes. This is a great chance to share a cup of coffee, verify the pipes are not frozen, and check on pets. · Be particularly mindful of older neighbors during a power outage. Lack of electrical power not only presents dangers associated with lack of heat, but also risks associated with non-functioning vital medical equipment, such as oxygen systems, emergency lighting, stair glides and medication timers. If you cannot contact someone you believe is in the house, contact your local police or emergency services. When weather circumstances dictate, the DHS Area Agency on Aging and its contracted providers contact frail, isolated and high-risk consumers who are registered for care management. Care managers visit those at highest risk and ensure each home is well-heated and has enough food, water and medication to last for several days. Care managers also respond to emergency needs as they arise. The Area Agency on Aging has already provided more than 2,400 “Snowy Weather Boxes” to at-risk older adults who are registered with the agency and often live alone. The boxes include toilet paper, non-skid slipper socks, hand sanitizer, flashlight and batteries, peanut butter, crackers, tuna, fruit, juice, bottled water, and other shelf-stable meals and drinks. Information about programs and services for older adults is available by calling SeniorLine at 412-350-5460 (TDD/TTY 412-350-2727), sending an email to SeniorLine@alleghenycounty.us, or visiting the DHS Older Adults website at www.alleghenycounty.us/dhs/olderadults.aspx.